Photos by David Karp and Toni Siebert, CVC.11/19/2015. Photo rights. Source: Received as budwood from CCPP, 01/2011. 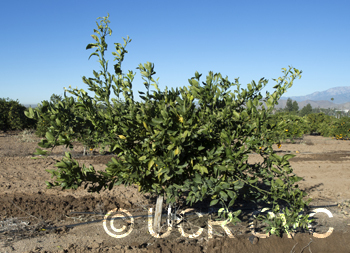 Parentage/origins: "'LA Early' is an open pollinated cultivar of unknown satsuma mandarin parentage. It was selected in the early 1980s from a group of seedlings planted in the late 1960s by the late Ralph Brown, first superintendent of the Citrus Research Station in Port Sulphur, La." (Bourgeois et al, 2001, 2002). 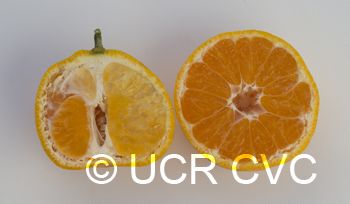 LA Early’ is a product of the citrus breeding program of the LSU AgCenter. This satsuma mandarin ripens in early September to mid October. ‘LA Early’ is an open pollinated seedling of unknown parentage. 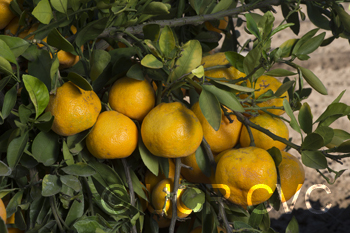 It was selected in the early 1980s from a group of seedlings planted in the late 1960s by the late Ralph Brown, first superintendent of the Citrus Research Station. ‘LA Early’ produces medium to large satsuma fruit, oblate in shape.’ ‘LA Early’ has a light yellow thin leathery skin with an attractive appearance. Skin adherence is slight to moderate, but it remains easy to peel. Fruit puffiness ranges from none to slight. Flesh color is orange, flesh is tender and melting, with easily separating segments. Fruit is considered to be seedless. Taste and flavor are excellent, with fruit being juicy, and slightly acid. Leaves are dark green, large (3-4" long and 1-2" wide), lanceolate, tapering at base and apex with thin petiole. ‘LA Early’ trees are medium in size but very productive, the tree is spreading with drooping thornless branches. Fruit bud and blossom set are heavy, with even distribution throughout the tree. Fruit maturity is early and not determined by skin color, thus having acceptable solid/acid ratio (10:1 ratio required for legal sale in Louisiana) quite early in the season. Information from "'LA Early': A New Early Market Satsuma", WJ Bourgeois, RJ Constantin, and MJ Falcon, Circular 140, May 2001, LSU AgCenter.